Did you know that you can make the fluffiest sponge cake in just 40 seconds in your microwave? Thanks to molecular gastronomy chef Ferran Adria, whose imagination and creativity has revolutionized high end cuisine in the past decade, you can now easily make an incredible sponge cake using your microwave, an iSi Whip and a paper cup. 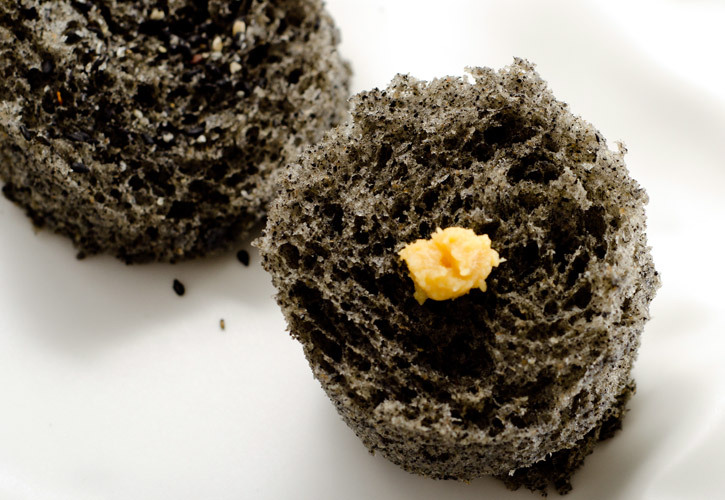 The secret of the el Bulli 40 second microwave sponge cake is to make an airy foam batter based on eggs using an iSi Whip and then cook it in a paper cup in a microwave. Unlike traditional cake batters, this one is mostly eggs with some sugar, the flavorful ingredient and just a little flour. Thanks to the light foam and the air trapped inside it, the resulting sponge cake has incredibly large air pockets which make it extra fluffy. The microwave sponge cake is also very moist, thanks to the high percentage of water provided by the eggs in the mixture . You can make different sponge cakes using this modernist cuisine technique. 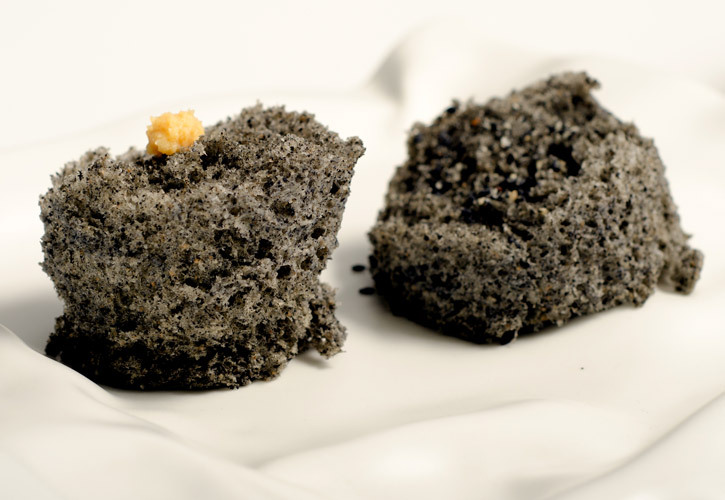 From basic chocolate, to savory versions such as tomato or this famous creation from Ferran Adria served at el Bulli which is made from black sesame and garnished with miso paste and sesame salt. We plated it on the Alma 8 5/8" Contoured Plate from the Montgatina collection. If you are interested in this incredible collection go here. Below you can watch a video of this recipe. 1- Toast black sesame in a pan at medium heat. 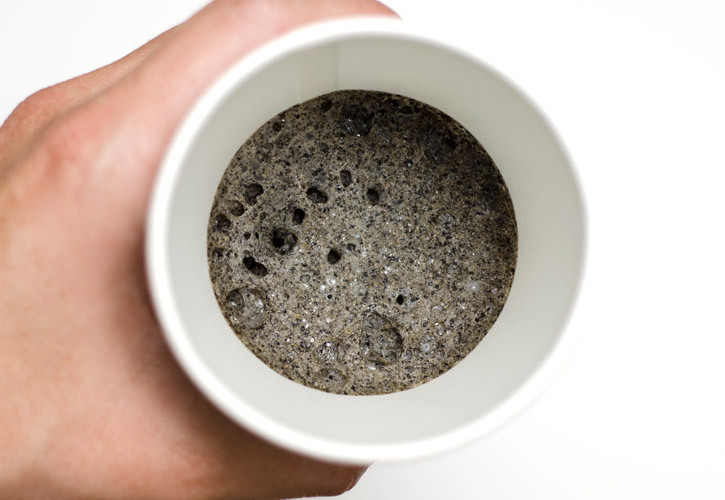 2- While still hot, mix the black sesame seeds with the toasted sesame oil in a mortar and crush it thoroughly using a pestle until you obtain a fine paste. 3- Pass paste through a sieve and reserve. 1- Mix the praline you prepared previously with the egg whites, egg yolks, sugar and flour until you obtain a smooth dough. 2- Pass through the iSi funnel and sieve and pour into a 1L iSi Whip. 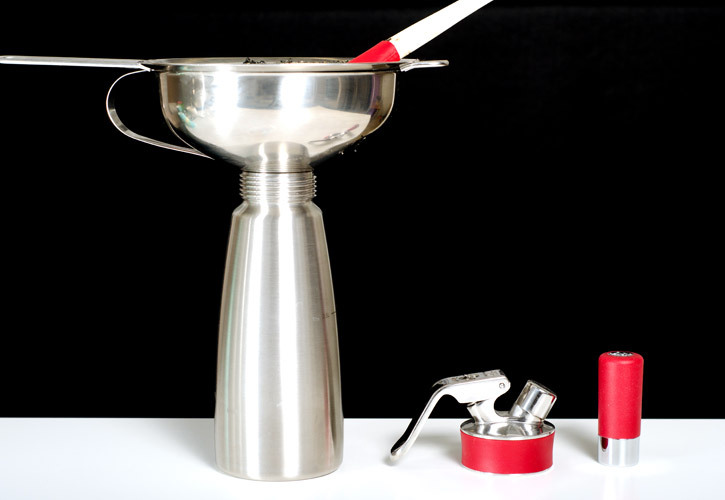 3- Charge the 1L iSi Whip with 4 N2O charges and shake each time. 4- Let it rest in the fridge for at least 2 to 4 hours. 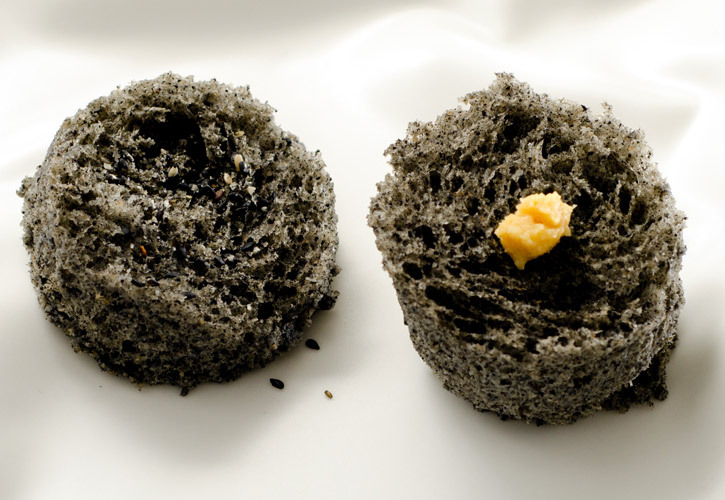 2- Mix toasted black sesame with salt and make a fine powder using a spice grinder. 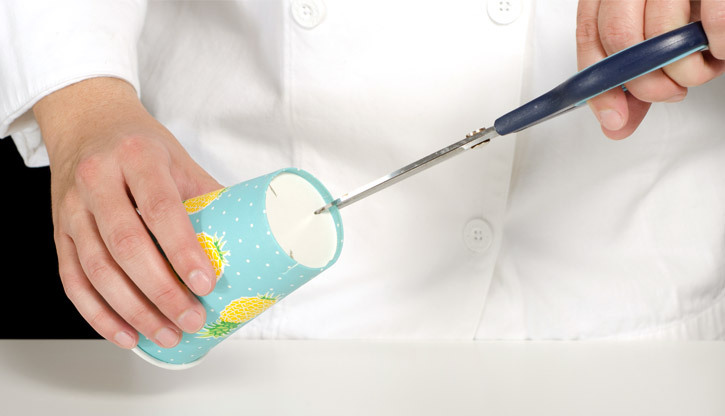 1- Prepare the paper cups by cutting 3 small slits on the base of the cups using scissors. This will allow the vapor generated while heating to escape. 2- Spray the cups with a light coat of non-stick spray to make it easier to release the delicate sponge cake once cooked. 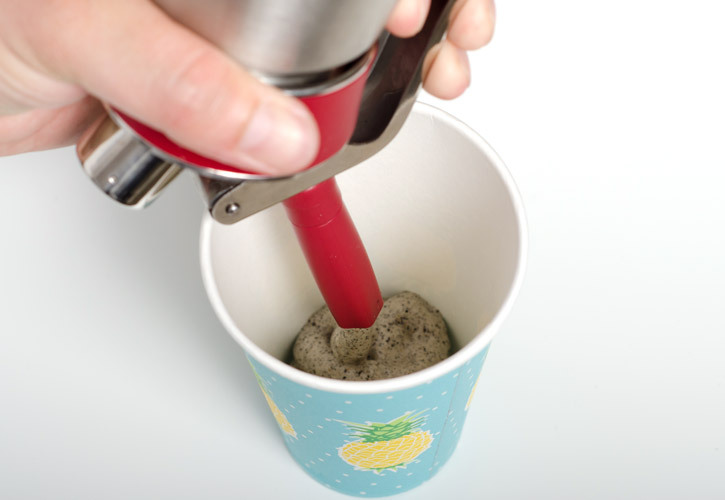 3- Using the iSi Whip siphon, fill about 1/3 of the paper cup with the black sesame foam. Foam will expand significantly when cooked so don’t fill the cup! 4- Place the filled cup in the microwave and cook for 40 seconds at maximum power. You can cook 2 or 3 sponge cakes at a time. 5- Remove from microwave and let it cool at room temperature. 6- With the help of a small spatula, carefully release the sponge cake from the paper cup. 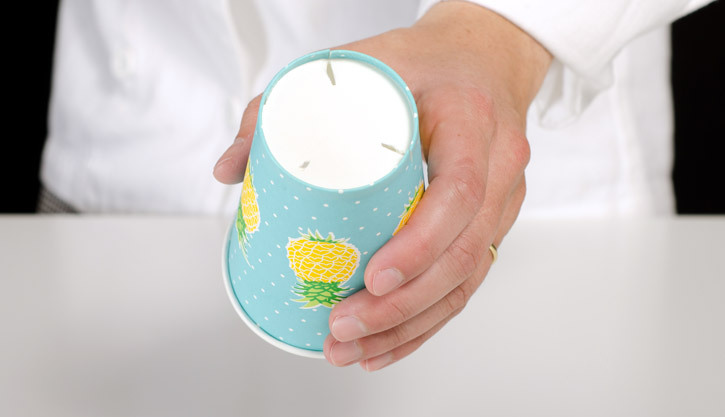 Flip the cup and tap the top to release the sponge cake. 1- Split the sponge cake in half using your hands and place on serving plate. 2- One one half, place a small dot of white miso paste. 3- On the other half, sprinkle some toasted sesame salt. 4- Suggest the diner to eat the miso side first.